PARIS (JTA) — Although his country is entering one of the most dramatic election campaigns in recent memory, Isy Morgensztern had no intention of exercising his right to vote. A left-wing Ashkenazi Jewish filmmaker from Paris, Morgensztern was too disappointed with the ruling Socialists under French President Francois Hollande to vote for them a second time in elections scheduled for April. But he is too disgusted by the Muslim baiting of the center- and far-right candidates to vote for them, either. That changed on Monday, when Prime Minister Manuel Valls announced his candidacy just two days after Hollande said he would not seek a second term, citing polls showing he is the least popular French president in decades. Many French Jews admire Valls, 54, for his tough stance against anti-Semitism. The Spanish-born prime minister, who once cited his marriage to the French Jewish musician Anne Gravoin in proclaiming an “eternal bond” with her people, has distinguished himself from other French leaders by calling anti-Zionism a form of anti-Semitism. And he has led a relentless legal assault on the anti-Semitic comedian and provocateur Dieudonne M’bala M’bala. These moves and others have earned him a hero status among France’s Jewish community of 500,000. More significantly for his presidential prospects, his reputation as a hardliner with a strong law-and-order agenda means he is widely seen as the left’s best hope for remaining in power amid a surge in right-wing popularity, fueled in part by terrorist attacks that have claimed hundreds of lives over the past year. Even before Valls’ candidacy, few French Jews had planned to sit out the vote like Morgensztern. Fearful of a strong showing for the far-right candidate Marine Le Pen, some of those interviewed at the CRIF event said they would have reluctantly voted for Hollande, though some resent him for his criticism of Israel and failure to prevent attacks on Jews. Other said they would vote for the hardliner Francois Fillon, a former prime minister who last week beat favorites Nicolas Sarkozy and Alain Juppe — the previous president and another former prime minister, respectively — in the primaries of the center-right Republicans party (formerly known as UMP). But Fillon, too, was an uneasy choice for many Jewish supporters. The Republicans nominee infuriated many French Jews with a radio interview last week in which he said that Muslim sectarianism should be fought like French society once fought the Jewish desire “to live in a community that does not respect the laws of the French Republic.” Fillon did not specify what historic era he had in mind. Still, with Hollande hopelessly trailing in the polls, even those angered by Fillon were preparing to vote for him — if only to block a victory by Le Pen, the president of the far-right National Front Party, which most French Jews still reject as essentially anti-Semitic. Current polls predict an unprecedented showing for National Front, with approximately 25 percent of the vote. For Le Pen, Fillon’s victory in the primaries may be bad news. His zero tolerance policy toward jihadism and his unassailable right-wing credentials make him a tempting alternative for voters who support hardline policies on Islam and immigration but fear Le Pen’s anti-E.U. agenda and extremist taint. Under Hollande and Valls, security forces have mounted an unprecedented effort to protect French Jews. Following the slaying of four people by a jihadist last year at a kosher supermarket in Paris, Hollande deployed 12,000 troops and policemen to guard Jewish institutions. Still, distrust of the left is widely shared among French Jews. Jean-Daniel Levy, a well-known pollster with the market research firm Harris Interactive, told JTA that Jewish voters who self-identify as such are increasingly supporting the right. Richard Prasquier, a former CRIF president, said Jews see Hollande as reluctant to name the religious nature of the problem facing French society and is too critical of Israel. “He is considered to be [easily] pressured,” Prasquier said of Hollande, recalling that after the kosher shop murders Hollande said that the crime “had nothing to do with the Muslim faith.” Hollande was slammed for the remark and later said he meant to say the killer’s interpretation of Islam was false. 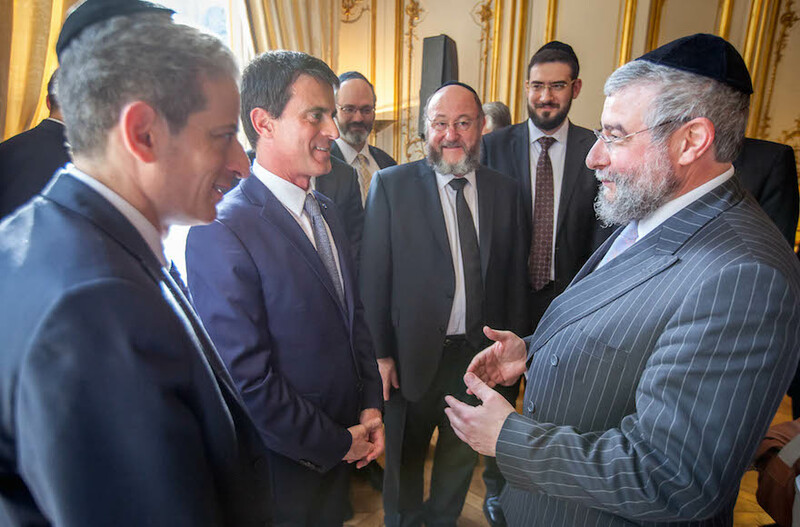 Valls could well revive Jewish support for the left in next year’s election. But his hard line on Islam also has a possible drawback: He might be seen as too far right for Muslims who might otherwise support a Socialist candidate, but not right enough to pull support from voters who might be drawn toward Fillon. An early poll, conducted just hours before Valls’ officially announced his candidacy, predicted he would receive only 10 percent of the vote in the first round of voting in April, trailing Fillon by a 17.5-point margin. French Jewish voters who vote for Valls in the first round may well find themselves having to choose between Fillon and Le Pen in the final round in May, after all.